We build all of our custom home furnishings using the same old world techniques and materials that were used back when everything was built to last forever. At ArtFactory.com we can design custom furnishings in any theme for either your residential or commercial property. This custom adjustable height table was designed to easily adjust to 3 different heights, thus providing a table to is at the paramount of both utility and style. This table, and all of our solid wood furnishings hand hewn, mortise, pegged and doweled, and built from natural, air cured solid exotic cedar cypress. We never use particle boards, veneers, laminates, or any other type of faux wood. When we say solid wood, we always mean the genuine article because fine art is never made with cheap, low quality materials. When you purchase custom furnishings from us, you can rest easy knowing that you will own a product that was built with the same materials and techniques that were used back when everything was built to last forever. All of our products are one-of-a-kind, limited edition, or old growth original works. All wood has been finished with 10 processes of hand rubbed lacquer over the stain. Our finish process includes five to ten coats of hand rubbed furniture quality clear oils, or water based non-toxic lacquers. It is applied, cured, rubbed and re-applied depending upon your order. Every surface of this furnishing is finely finished including the undersides and hidden areas. These furnishings are built to investment quality, and are finished to both virtually maintenance free and stand the test of time. You may choose the natural color, from over 400 standard stain colors, or we will computer color match to any color stain you may desire. Most of our finishes are water based and earth friendly. This custom adjustable height table features an easy but reliable system to vary the table's height as is necessary for different projects. Like all of our products, it is at the forefront of both style and utility. Building fine art quality furniture as a family legacy has been going on since the beginning of time. Building heirloom furniture intended to last forever is one of the primary ways we all have in achieving some small part of immortality that will touch our loved ones for many generations. In the same way, many societies such as the Egyptians, Mayans, and many kings and queens, as well as the European aristocracy have created and passed down heirlooms for thousands of years. In fact, if it were not for the artifacts found, it would be impossible to know these people ever existed, and how they contributed to a better and art filled world for mankind. This is also the case in the 21st century within your own family. No matter if it's a simple fine art, handmade, one-of-a-kind placard, hope chest, etc. with your personal message or name as a gift to a loved one, or a master, hand crafted, fine art custom adjustable height table. These types of items are often reserved for commemorating and expressing your love for each other by having your inscribed message. All product designs are a collaboration which includes your participation, along with our world class art department, headed by award winning artist H.J. Nick. At ArtFactory.com, we specialize in creating heirlooms for your family that will be cherished for generations. That has always been our business since 1913. 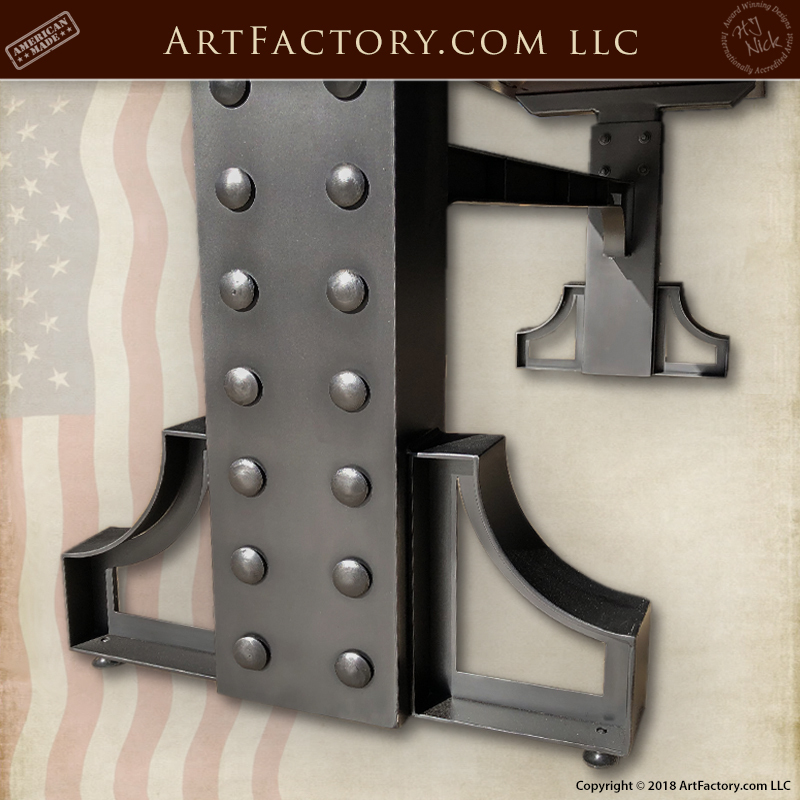 The industrial style, and strength table legs and base are constructed from solid, hand forged wrought iron. Blacksmith hand forged wrought iron allows us to provide an unmatched level of durability, and a product that will stand the test of time with little or no maintenance. This custom adjustable height table features and industrial strength, hand forged iron legs and base. This adjustable height, solid iron base and table legs, along with the metal edge surrounding the table hand forged by our master blacksmiths. We use solid, hand forged wrought iron because no other type of metal offers as much durability and resistance to the elements. Like all of our hand forged wrought iron products, it has been finished with a hand applied, heat infused, iron oxide patina. These patinas are infused to the metal at over 1000 degrees Fahrenheit so that the finish actually becomes part of the metal. All of this adds up to a product that will look beautiful from day one, and for generations to come with little or no maintenance. This furniture is built to last forever using the finest craftsmanship in the world and the finest materials. Not only is this an investment quality piece and an appreciable asset that will add to your financial net worth, in the eyes of your family it will become a cherished family heirloom and a priceless piece of immortality that will be tangible for generations into eternity as a way to celebrate your life and its direct effects on who they are and what the family stands for under your influence and thoughtfulness. True artifacts enhance and enrich all of our lives in a way that mass-produced merchandise never will, thus preserving the best of man kinds creativity and expressing our love for each other. We are so confident in the quality of our materials and craftsmanship that we guarantee everything forever. Call us today at 1-800-292-0008 to get pricing on your very own family heirloom quality, custom adjustable height table. 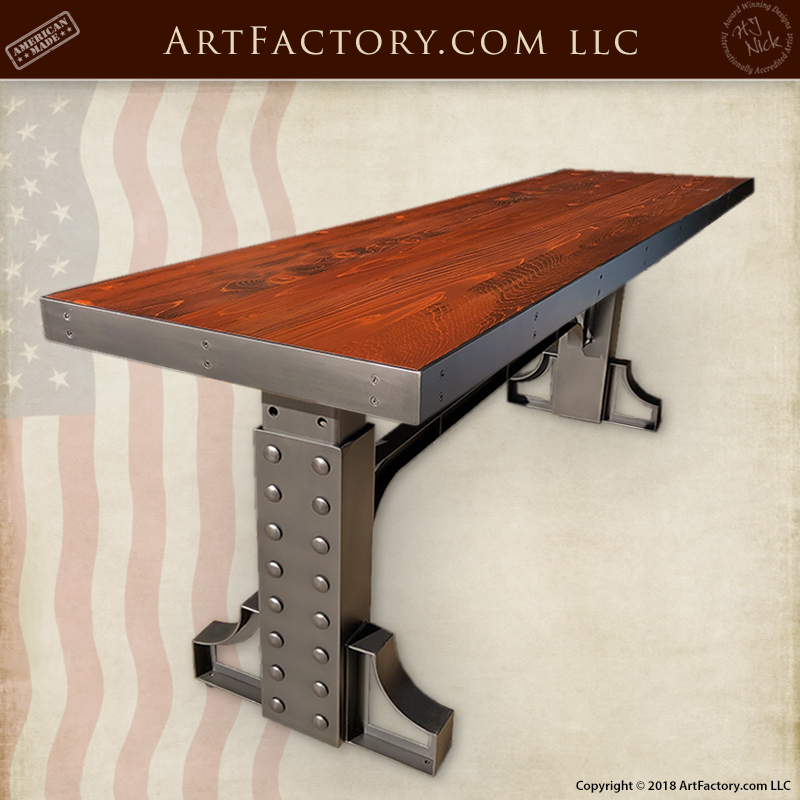 This custom log style executive desk and all of our solid wood office furniture is handcrafted in America at ArtFactory.com. This fine art solid wood desk is available in any style and size, as if all of our custom furniture. 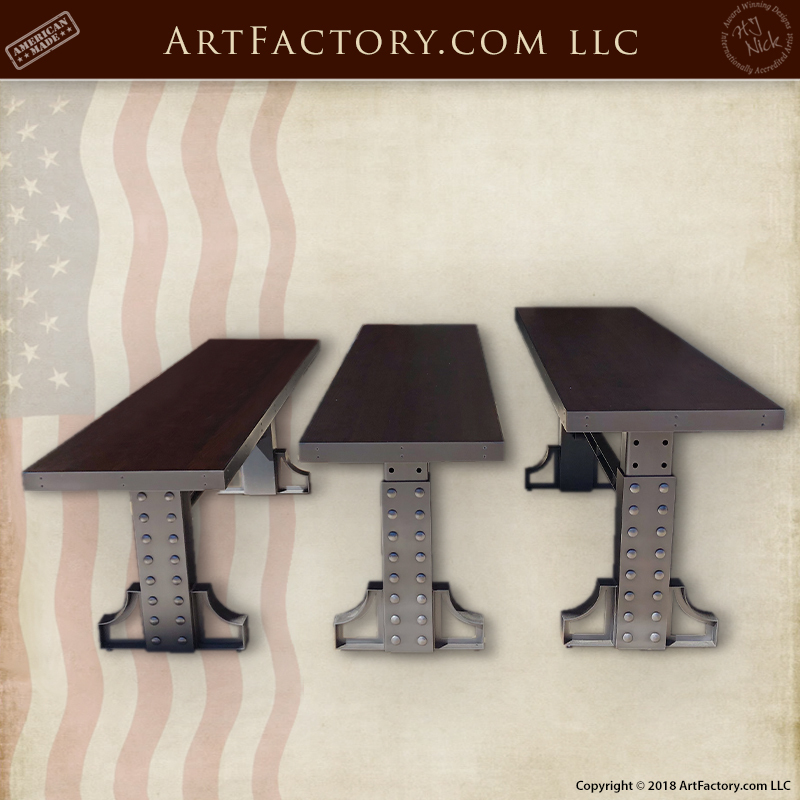 All custom office furniture made at ArtFactory.com is hand hewn constructed using mortise and tenon joinery by our master craftsmen. Not a reproduction, but an original craft – hand crafted in the same materials and craftsmanship as the original. Certified fine art investment quality handmade furnishing. All custom wood desks include a hand applied 10 – 15 step process fine art finish on all sides to enhance the beauty of this designer office desk. Hand rubbed, many process finish on all custom wood furniture no fast process spray or wipe-on. Call to discuss your custom office desks with our furniture designer today at 1-800-292-0008. 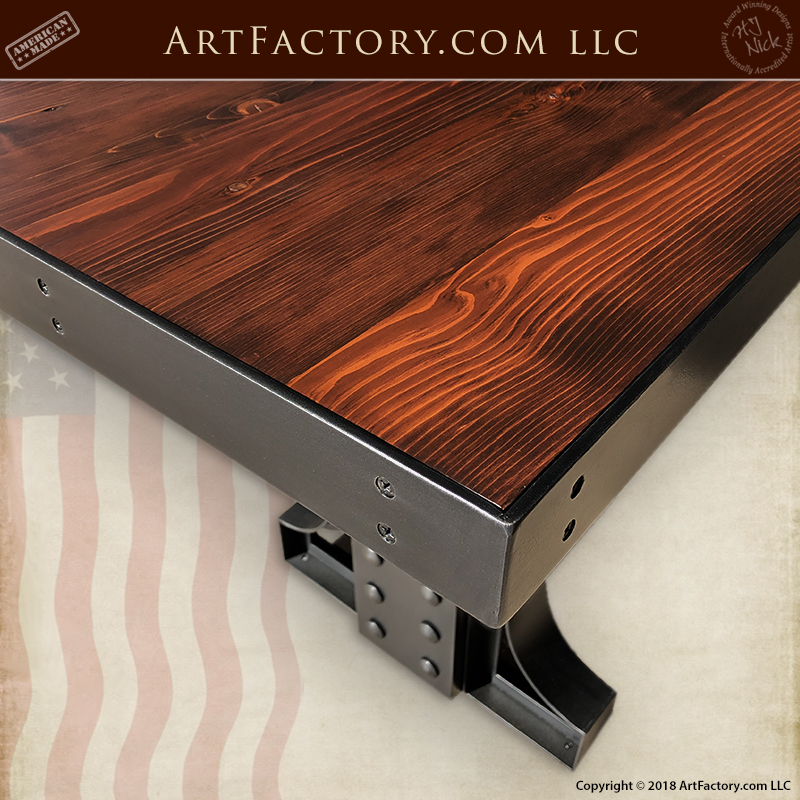 ArtFactory.com is an American manufacturer of custom furniture, wood doors, gates, and designer furnishings based in Scottsdale, Arizona. Featuring designs by H.J. Nick, have been designing and building some of the world's finest furnishings all hand crafted in America since 1913. Most of our clients want a furnishing that has a big WOW factor and timeless elegance. They all want investment value furnishings that make a proper statement reflecting their personality, or the personality of the environment for which the designer custom furnishings are intended. Our master level craftsmanship ensures your custom wrought iron gates and furnishings will stand the test of time, and are guaranteed forever, backed by over a century of fine craftsmanship. Call us to discuss your custom furniture design ideas 1-800-292-0008.